The list of Coriolanus characters provide a convenient introduction to the William Shakespeare play summary of Coriolanus. The male and female characters bring the plot of the play to life. Not only do we remember the stories but we remember the people - we all have our favourite characters. The following short summary of Coriolanus provides a brief description of this famous William Shakespeare play. The story of the plot with its famous characters via the summary of Coriolanus. Interesting facts and information about the Globe Theatre of Elizabethan London with a William Shakespeare Play Summary of Coriolanus with a list of Characters. This drama is one of the great tragedy and political themed plays by William Shakespeare. The plot and story covers the life of the mighty warrior Caius Marcius Coriolanus. It covers many issues including pride of coming before a fall. The ambitious mother of of the hero plays a large part in his initial successes. Coriolanus supports the old Patrician views and lifestyle and is totally out of tune with the needs of the ordinary people. Aufidius, jealous of Coriolanus's popularity with the Volscians, denounces him as a traitor, and the Volscians then kill the Roman. 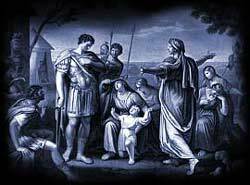 He then regrets his action and praises Coriolanus a real hero. Interesting Facts and information about the Summary of Coriolanus and Characters. Additional details, facts and information about the Globe Theatre and the summary and characters of other William Shakespeare plays can be accessed via the Globe Theatre Sitemap.